"But these words were heavier than even the death of a clan champion—or a brother. This scroll, this particular piece of paper, was likely the most important he would ever write. No, this scroll would be the most important one that would be written—during his lifetime, at least." Children of the Empire places a heavy emphasis on honor—not just on the honor of your individual characters, but your clan as a whole. In the field of battle and in the courts, composure is key to victory. Composure is a new mechanic introduced here, in Children of the Empire. So long as your honor bid is lower than an opponent’s, you are considered to have composure. While this does nothing on its own, every clan gains new cards with effects that only activate if you have achieved composure. For example, the Student of War (Children of the Empire, 23) is a straightforward Bushi with three military and two political skill. However, if you have composure, the Student of War cannot lose fate or be discarded! If you can consistently keep your honor dial lower than your opponent’s, the Student of War will never abandon you, fighting by your side until victory is reached. Of course, maintaining composure can be just as hard as achieving it, especially if your enemy operates by undermining your honor. The Scorpion thrive on high-honor bids, and may struggle to gain composure through traditional means… but the Scorpion have never been the most traditional clan. As long as you have composure, the Scorpion can manipulate the target of your opponent’s events with the Social Puppeteer (Children of the Empire, 34). 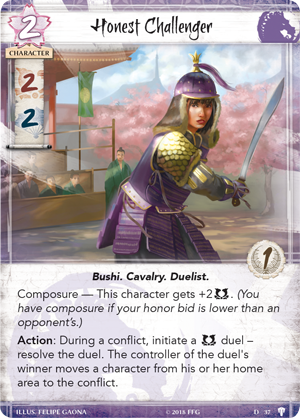 While this is a strong ability on its own, this three-cost Courtier also offers a way to gain composure by switching honor dials with your opponent during a conflict! If you steal an honor dial with a lower bid than yours, this can quickly swing things in your favor. Not only must your opponent now focus on the Puppeteer, their own composure characters deactivate, giving the Scorpion the advantage. Gaining and maintaining composure can be a difficult task, but the rewards can be game-defining. You'll make an honor bid every round as you draw more cards, but that's not the only time that you can gain or lose composure. 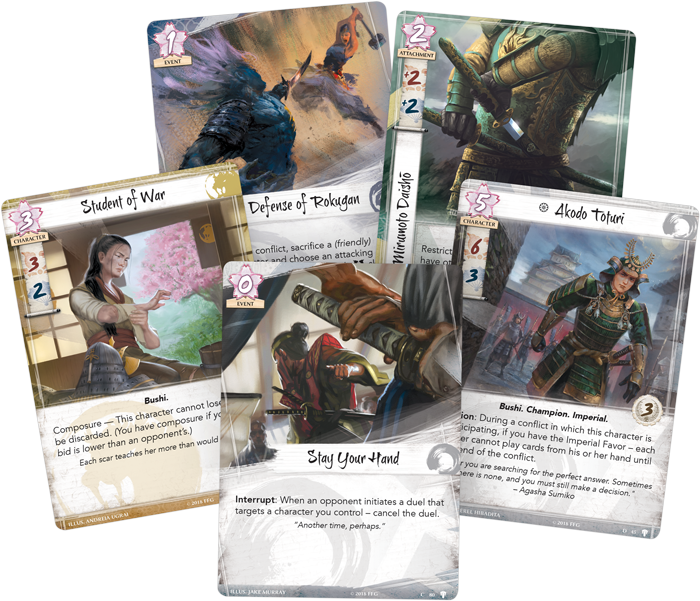 Fittingly, Children of the Empire also places a heavy emphasis on duels, and it starts by updating the template for the mechanic. 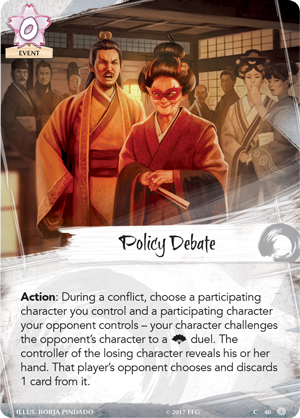 Repetitive wording on cards like Policy Debate (For Honor and Glory, 40) has been replaced by the simple phrase, “Initiate a duel,” making cards clearer and allowing space for more complicated effects. To initiate a duel, the player resolving the ability simply chooses two characters to duel against each other: one they control and one controlled by an opponent. If the duel was triggered by the ability of a character, that character must be your representative in the duel. More importantly, every clan will receive at least one new Duelist character to add to their ranks—challenger characters that initiate duels during conflicts for potent effects. 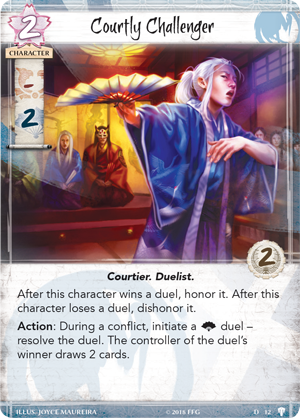 The court is the domain of the Crane, and though their Kakita duelists are deadly with steel, the clan’s words cut just as deep. 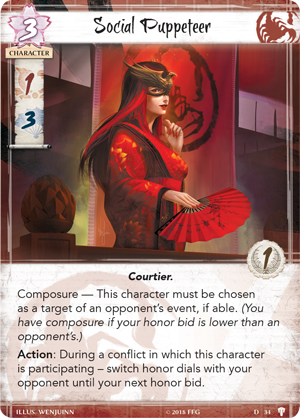 The Courtly Challenger (Children of the Empire, 12) is a two-cost Duelist that becomes honored when it wins a duel, and dishonored when it loses a duel. Moreover, as an Action, you may initiate a political duel, with the winner drawing two cards. 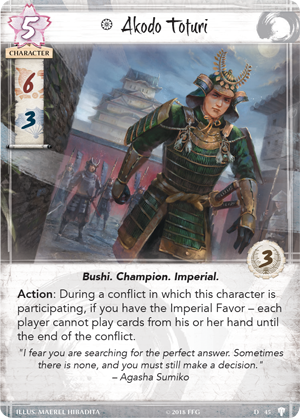 With powerful composure cards introduced in Children of the Empire, low honor bids will be attractive, but this means less cards for your conflict hand. Luckily for the Crane, cards like the Courtly Challenger can keep your hand stocked and your honor bid low. The Unicorn, meanwhile, gain the power of the Honest Challenger (Children of the Empire, 37). This more traditional Duelist gains two military skill while you have composure, and a successful military duel lets you move a character into the conflict, perhaps giving you the backup to break a province. If you maintain your composure, your opponent will be hard-pressed to defeat the Honest Challenger in a one-on-one duel, especially considering you're always picking your opponent. Of course, this cycle isn’t the only duel support in Children of the Empire—you can look for events that trigger duels, more experienced duelists to join your clan, and more. 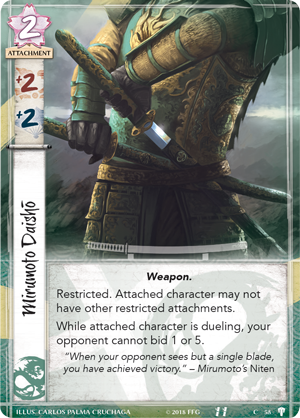 For example, the Mirumoto Daishō (Children of the Empire, 58) is a powerful new Dragon attachment that provides a buff to both military and political skill. However, it’s true power is revealed during a duel, as it prevents your opponent from bidding 1 or 5. Not only does this restrict your opponent’s options, it can ensure victory for your Duelist when the time is right. 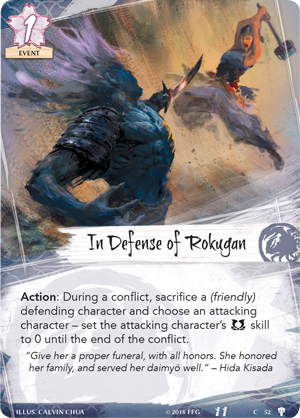 Children of the Empire is a snapshot of Rokugan, a celebration and examination of the events that have unfolded since the launch of the game. 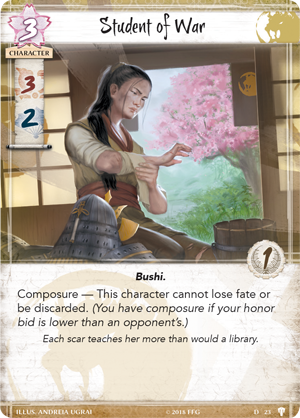 As such, it includes cards that reference some of the most important story moments in Legend of the Five Rings: The Card Game. Hida Kisada constantly oversees the fight against attacks from the Shadowlands. Some attacks are worse than others, and one led by an obsidian-plated oni was significant enough that Kisada himself had to intervene, as described in “Dark Hands of Heaven” by Annie VanderMeer Mitsoda. While Kisada was evenly matched with the oni, his leadership was needed elsewhere in the battle, so a loyal retainer named Hida Tomonatsu intervened and sacrificed herself to bring the oni down. In Defense of Rokugan (Children of the Empire, 52) recreates that moment of Tomonatsu’s sacrifice, allowing the Crab to sacrifice a defender to reduce an attacker’s military skill to zero for a conflict. Not every character is created equal, and a Marauding Oni dwarfs the skill of an Eager Scout. But for one moment, the scales equal and a moment of bravery and self-sacrifice can defeat even the strongest of foes. In Robert Denton III’s novella, The Sword and the Spirits, Shiba Tsukune pursued Isawa Tadaka to the remote shrine of Sanpuku Seidō. What neither expected to find was a shrine haunted by spirits from Tōshigoku, the Realm of Slaughter. Together, the two—with the help of an unassuming shrine maiden named Kaito Kosori—banded together to fight the spirits that infested the shrine and cleanse it of a long-forgotten enemy. 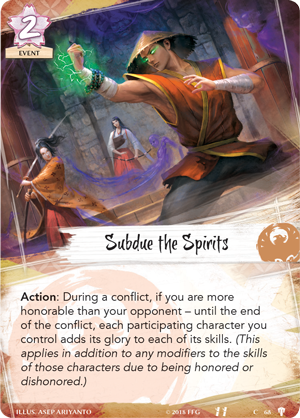 Subdue the Spirits (Children of the Empire, 68) represents this conflict, allowing you to add your characters' glory to their skills during a conflict in which you are more honorable than your opponent. Since this even stacks with characters who are already honored, this can give a massive boost to the Phoenix regardless of what conflict type you find yourself in! 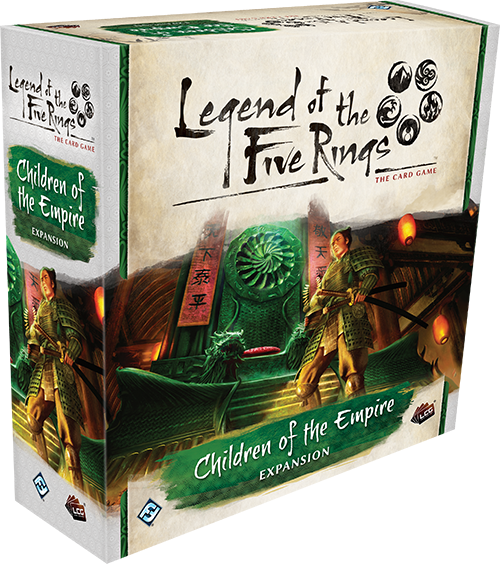 Finally, Children of the Empire includes multiple neutral cards focusing on the Hantei dynasty, and includes a new version of one of Legend of the Five Rings most prolific characters. 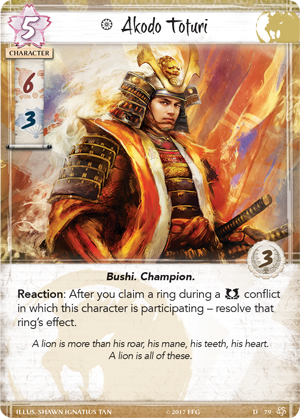 Akodo Toturi (Core Set, 79) began his journey as the Lion Clan Champion, but the heavens have forged a new path for him as the Emperor’s right hand. As the Emerald Champion, Akodo Toturi must now balance his duty to his clan and his duty to the Emperor. Children of the Empire’s Akodo Toturi (Children of the Empire, 45) is a neutral, five-cost character with impressive skills, and so long as you hold the Imperial Favor, the ability to lock your opponent down. As an Action during a conflict with Akodo Toturi, you may declare that each player cannot play cards from their hand until the end of the conflict! Akodo Toturi seeks the truth and has no patience for underhanded methods. You’ll have to succeed on the field of battle or in court if you have any hope of victory. While triggering this Action also prevents you from playing cards, Toturi's ability can be used at any point in the conflict, ultimately triggering this only after you've played any cards you need to!